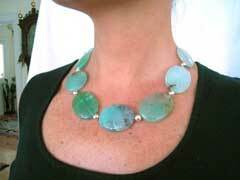 large, bold, striking necklaces that are bound to be noticed! 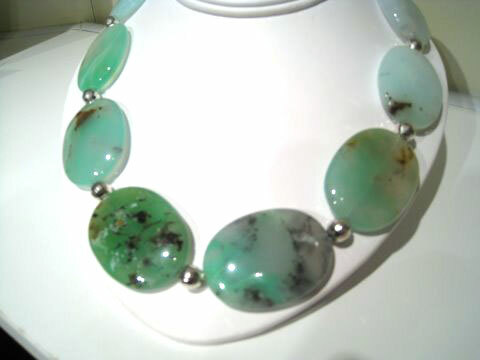 Beautiful large aquamarine beads. 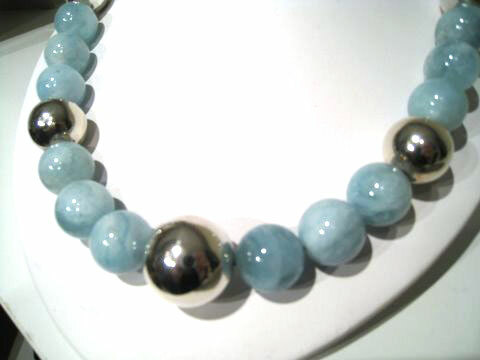 A lustrous shade of blue, set off with large sterling silver beads. Very wearable and eye catching. 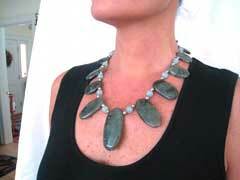 Unparalleled, very large green moonstone necklace. One for everyone to notice. 4 large pillow shaped gold filled beads and a large vermeil toggle clasp completes this spectacular necklace. 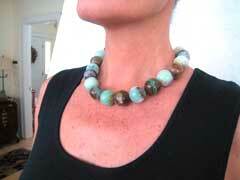 Delicate shades of aqua and greens make you think of Caribbean seas. And, like the seas, there are objects where you look down deep. 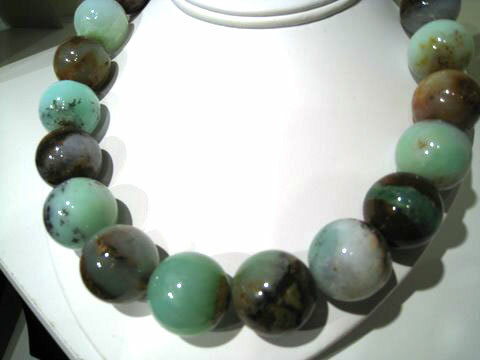 Large Queensland chrysophase ovals separated with sterling disco beads. Where the earth and the Caribbean waters come together. 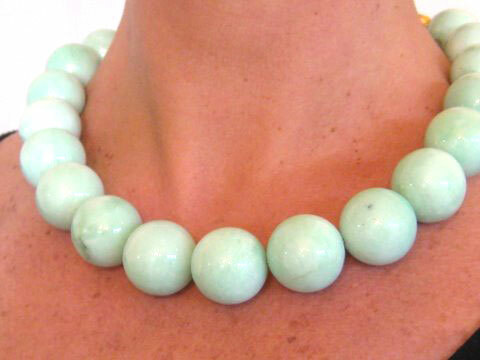 These large round Queensland chrysophase beads are shades of browns, light sea greens and foamy whites. Big and bold. 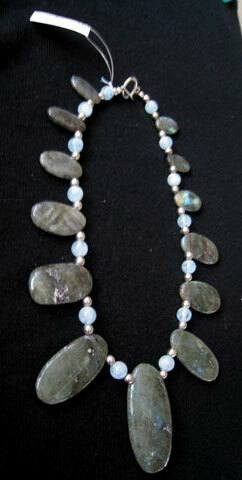 Large dark green Canadian labradorite graduated ovals strung with aquamarine beads to pick up the labradoresescent blues. 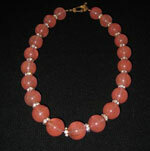 Finished with Southwest sterling beads and a sterling toggle clasp. 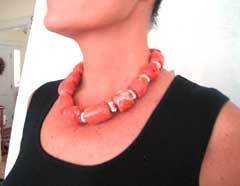 All coral is becoming rare. 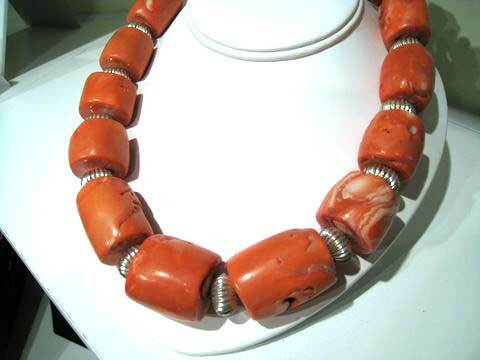 These big chunks of coral colored Chinese sea bamboo coral are so special. Separated by sterling fan beads and finished with a large sterling toggle clasp.